When I was a kid I either wanted to be a F/X Artist or a Stuntman in horror movies. That's right a Stuntman in a horror movie. 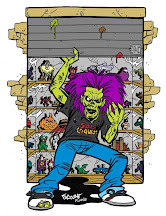 Think about it, if you're not the one making monsters you can be the guy turning it up to eleven by jumping off a building,smashing through a glass window, falling down stairs, getting hit by and crashing cars or getting set on fire! 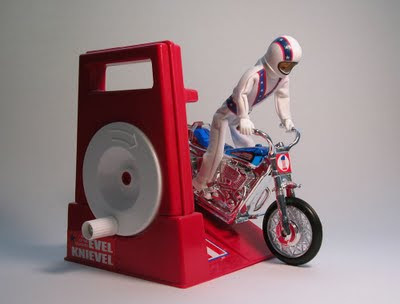 And that started my stuntman obsession when I was a kid. And I couldn't have timed it any better it was like everybody thought the same thing in the 70's and there was Stuntman everything!!! 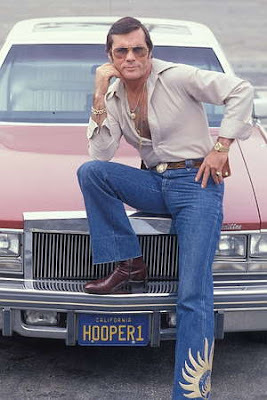 And a man named "Hal Needham" was the go to guy (But I'll get back to him a little later). 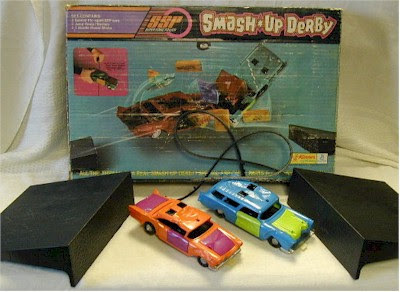 I think the first time stunt work was used in my Mental Horror Movie Studio in my backyard back lot was when I was given the "SSP Smash Up Derby" for Christmas. 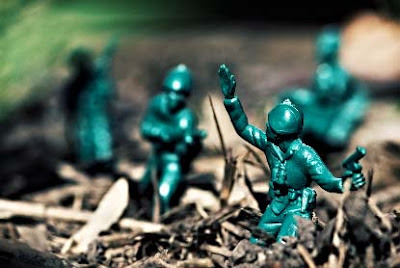 They were cool on their own, but I had an idea where the Green Army Men were far from their mountain base and had to take cover in a junk yard. 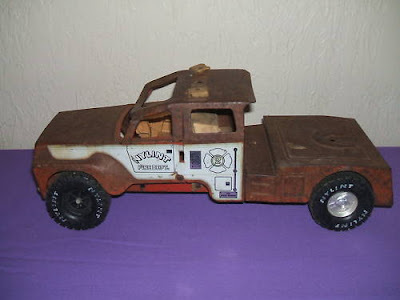 I've always had an obsession with junkyards and with a lot of kids in the neighborhood trashing and throwing out some great trashed Buddy L, Nylint, Tonka and Marx pressed steel trucks I was set. The more smashed and rusted they were the better! Once the Green Army Men had the area secured they would work on getting the SSP Cars up and running enough to ram their way through whatever was attacking them. Sometimes it was giant rats or giant spiders, other times it would be dinosaurs or robots. And either they would make it or they wouldn't. Sometimes both cars would get through others it would be only one and the (imaginary passengers) would die in the wreck and get eaten. 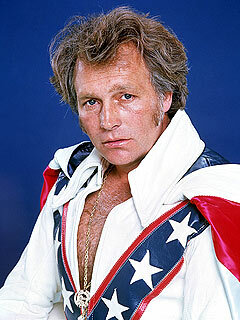 Then there was a man by the name of "Evel Knievel"
"So what does he have to do with your stuntman monster adventures?" you ask. I'm going to answer with "Check this out!" And it even had it's own monster! 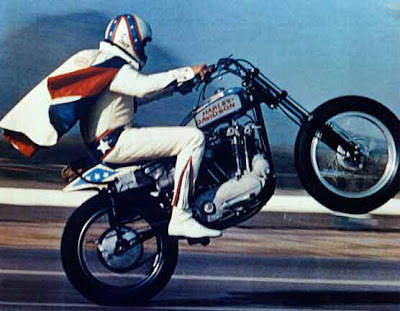 They would have it out for Evel for one reason or another and try to capture him at Skull Canyon. 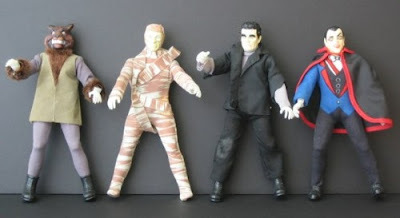 And there were times where Evel would make his escape and others where he would wind up as dinner for Dracula and the Wolfman and spare parts for Frankenstein. 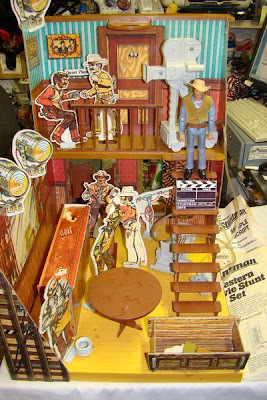 "The Hal Needham Stuntman Playset"
This toy was insane!!! 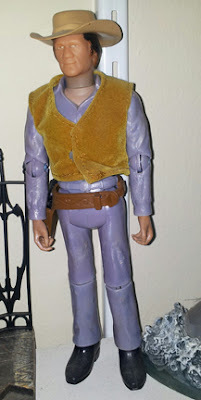 It came with a Hal Needham figure and had break away furniture, a stair case for him to fall down, a break away window, a stair railing for him to fall through. 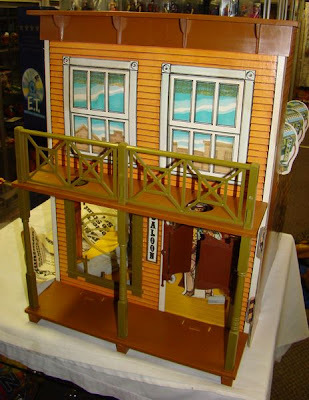 Then there was a small moveable lift that you would set up to have him fall and you could go as high as the top of the set to the top of the stairs and have him crash down on the break away furniture. The chair and window frame are missing from this set but it still has the camera that's the air actuator for the platform. And it has the clapboard and script. 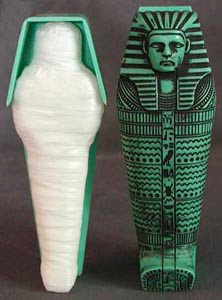 There's also a rubber band driven air ram that you would send the figure flying through the window or hook up a string to it to pull him back through the window like he was shot. This sent my Mental Horror Movie Studio to a whole new level. It went from being a back lot production to having a sound stage with a huge prop department and lots of extras! were actually a double bill at one time. She even built a monster too!!! The only reason I said accidentally was my Aunt thought it came with the figures because they were all pictured on the box. 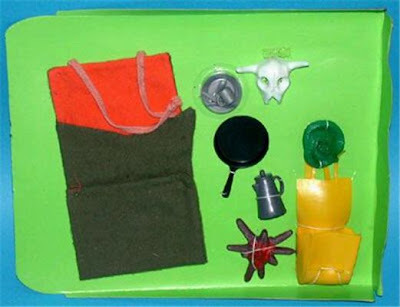 This would have sent other kids into a fit, but for me it was perfect scale and gave the monsters a base of operations and armed Hal to the teeth. 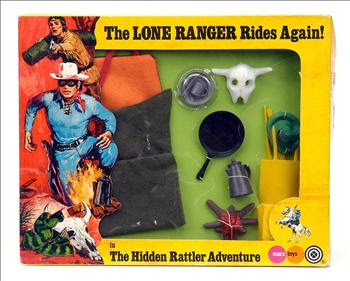 Then another relative thought I had the "Lone Ranger"
so I wound up with this. And the set was complete. Then there were toys left over from my G.I. Joe's that had a new life as the focal points of new adventures. 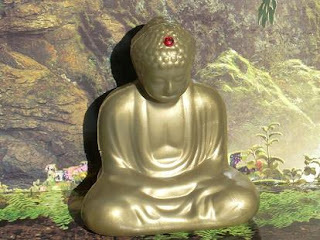 This was the golden statue that held Dracula's Blood Stones and only Frankenstein, The Wolfman and The Mummy could handle and open for him to get his riches back. 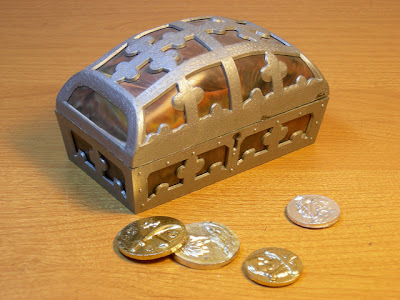 And this was Dr. Frankenstein's treasure that Dracula wanted to finance whatever evil plan he had. 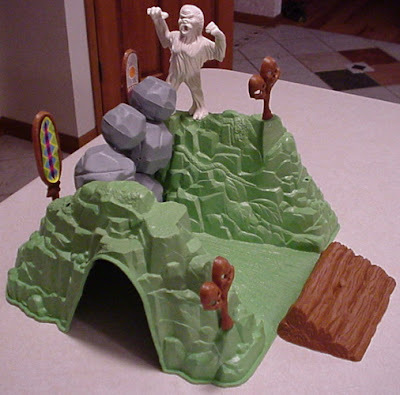 The only thing that sucked about the playset was allot of it was made out of cardboard and the break way furniture would finally break altogether. six gun still in his holster. Never getting tired of Not of this earth! 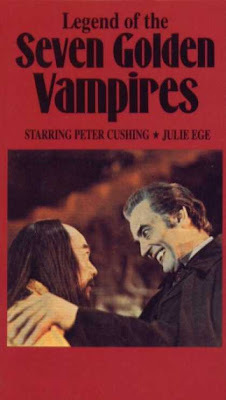 received this in the mail on VHS. 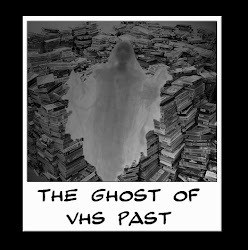 The second Warren told my friend Shawn T. Reich and me what it was we just about ran to the editing room's (entertainment) VCR to see it. But before that we had to make a run to WAWA for some movie food and a couple gallons of Iced Tea. 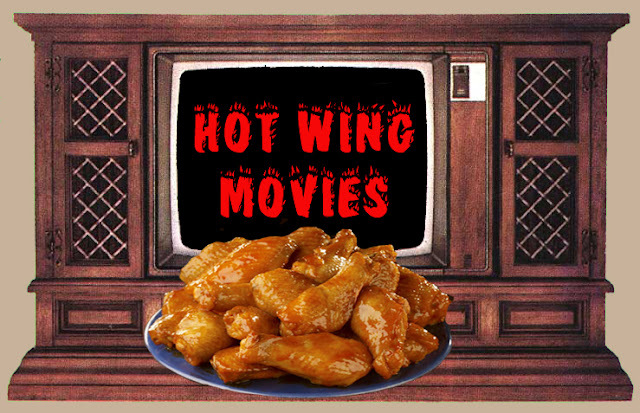 Now if you've read anything on this site before you know that I make no apologies for loving Cheesy Movies. 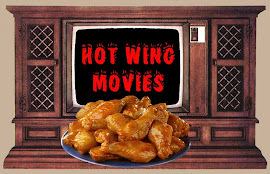 Not bad movies (Even they can have a huge budget) but Cheesy Movies where the person responsible entertains me for an hour and a half with a good story and the best of their abilities. And does this one deliver! 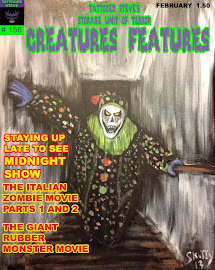 It has footage from a Drive - In Cheese Master "Mister Roger Corman" and great add in's to the original script from 1957. 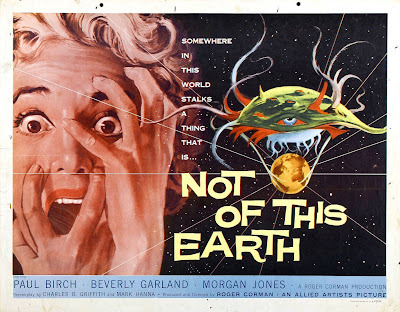 Yup, "Not of This Earth" was originally done in 1957.
and directed by Roger Corman. 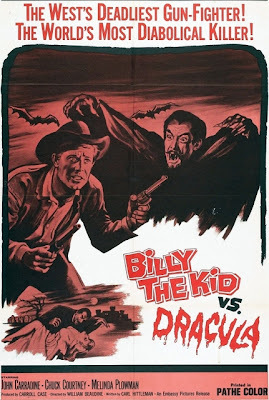 It's one of my favorite Drive - In black and whites and has Paul Birch as the original Alien Space Vampire . The inhabitants of Davanna who are at war with each other send "Mr. Johnson" to Earth to see if he can find a viable blood replacement for their own that's diseased and evaporates. While he's here he needs his own replaced so he can continue his research. He enlist the help of a doctor specializing in blood and hires his nurse to do daily transfusions of new blood. 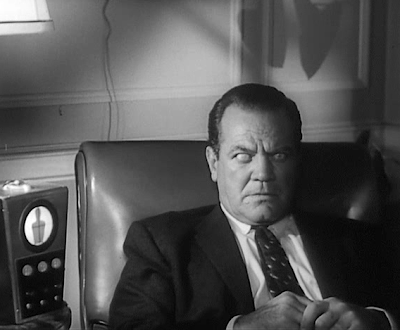 The only problem unknown to the nurse is Mr. Johnson gets his blood supply from people in the area after he kills them with his eye death rays and drains them with a machine he keeps in a briefcase. And when she finds out about his mission the fun really starts. 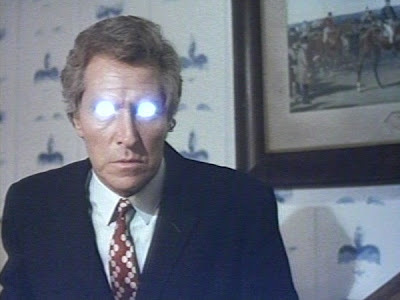 Now when Warren had shown us the 1988 remake he had told us that it was shot with the original script, but writer R.J. Robertson and had made some add on's to make it appeal to 80's Video Store audiences. They had cast Traci Lords as the nurse and Arthur Roberts as "Mr. Johnson". 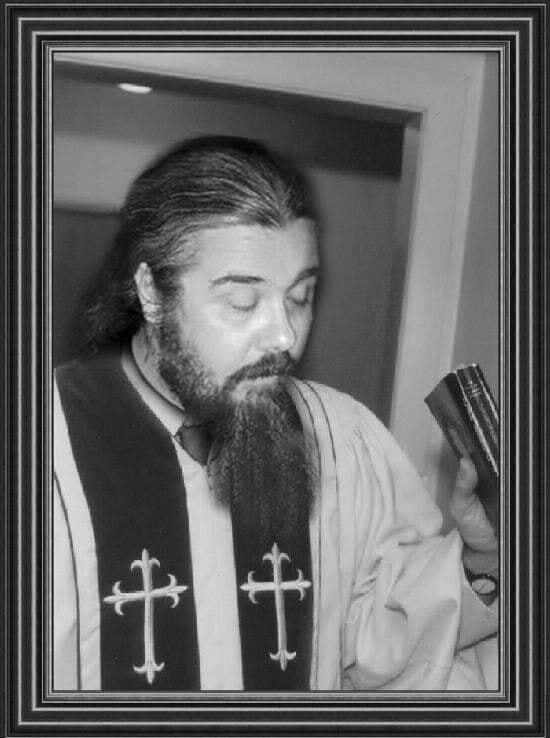 You would probably remember him as the bad guy from allot of the 70's and 80's cop shows. Extra points if you remember him as this guy!!! Within the first minute and a half we were cracking up because during the opening credits. I guess to establish the Sci-Fi feel of the movie they had used clips from "Battle beyond the Sun" (1960), "Battle Beyond The Stars" (1980) Which has John Saxon and is a pretty good movie with a Battle Star Galactica feel to it, "Forbidden World" (1982), "Galaxy of Terror" (1981), "Humanoids From The Deep (1980) Love that one, Piranha (1978) Another favorite and for some unknown reason the matte painting castle from "The Raven" and a bunch of other Roger Corman "Edgar Allen Poe" movies that he made. All of the one's I listed are Corman's but we couldn't figure out why they used the castle? The movie had a ton of production goofs like not framing the set so you couldn't see where the tops of the foyer set walls ended, and there were some really bad continuity match ups with complete scenes from Hollywood Boulevard and Humanoids From The Deep. But it still kept to the story and was a fun watch. Another one of the coolest things about it was they used some of the original props from the 1957 movie. Then add to that Traci Lords and the rest of the cast did a great job of keeping the story moving and getting you to like the characters, so you didn't mind the production flaws. Session 9 (2001) has to be one of my favorite psychological thriller/ghost story movies. 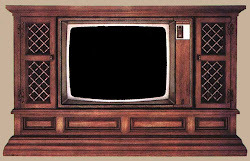 It was written by Brad Anderson and Stephen Gevedon, and directed by Brad Anderson. The story revolves around Gordon Flemming's (Peter Mullan) Hazmat Elimination Company being hired to remove the asbestos from long closed down The Denver State Mental Asylum. Gordon gets the bid by giving a quote where the work can be completed in a single week. His supervisor Phil (David Caruso) isn't exactly happy about it but knows Gordon is a new father and work hasn't been as steady due to competing companies, so he goes along with it. Another thing that Phil is not looking forward to is working with a man named "Hank" who is now dating his once long time girlfriend. 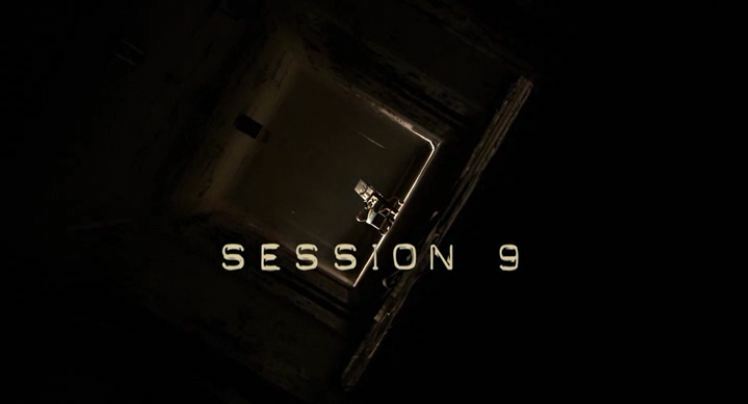 As the work progresses one of Gordon's workers Mike (Stephen Gevedon) finds a reel to reel tape recorder and a tape reel boxes labeled "Evidence - Sessions 1 through 9" in one of the rooms of the asylum. 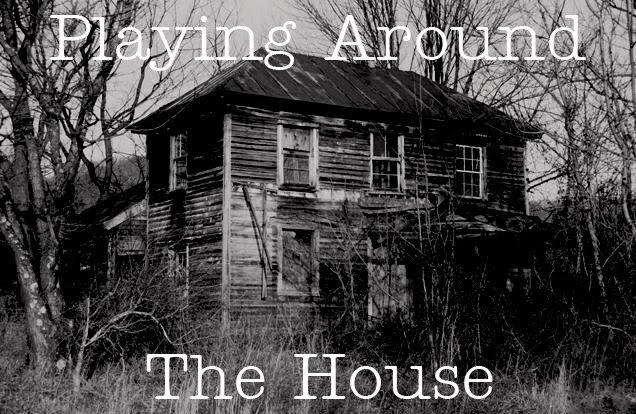 During his breaks and when he can sneak away he listens to the recordings of a session being conducted with a 37 year old woman by the name of Mary Hobbes in 1974 9 (she is also known as patient #444). As he listens to them he's fascinated in hearing her speaking through multiple personalities who claim to reside in different parts of her head, they communicate to each other but all refuse to deal with one by the name of Simon. And there seems to be more to her story that involves a China Doll given to her for Christmas in 1951 when she was fourteen that she's holding back on. 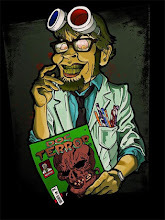 Another member of the team is Gordon's nephew Jeff (Brenden Sexton III) who suffers from Nyctophobia (Fear of the dark). And being the young guy on the crew spends most of his time being told which task has to be done. During a little down time Mike gets Jeff up to speed on who not to piss off (Mainly Phil) or he'll spend the rest of the week doing the worst of what has to be done. During a conversation between Gordon and Phil we find out that Gordon has been sleeping in his work van for a few days after having an argument with his wife and had hit her. He's been trying to reach her on his cell phone, but she won't answer his calls. Phil reassures him that she'll talk to him when she's ready, and once the works done and he has the money it'll help allot with the stress between them. Hank manages to come across a little find of his own, and gets a boat load of trouble along with it. And after he doesn't show up for work the next day tempers flair and goings on take a real bad turn from then on. I think the main reason I connected with it so much was I literally grew up on job sites. When I wasn't working for my Dad I would work with demolition companies allot, and it was wild how dead on the movie got the personality types down. I was the chuckle headed kid (Jeff) being told who not to piss off (Mainly the Supervisor) but grew into the guy that had the cool weekend stories with the pictures to prove it (Hank) and reliable enough to where the supervisor had to tolerate allot of my crap. 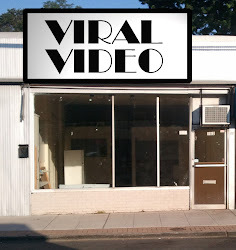 The companies were always owned by an old school hard worker like Gordon that you respected and tried to keep up with. And run by an over achieving Gordon wannabe like Phil who was good at telling people what to do, but never had the brass ones to start their own crew. But the ones that always stuck with me the most were the (Mike) types. They always had some kind of degree, were really cool to talk to and always managed to steer you away from the rocks. And they would always make you think "You're beyond smart why the hell are you swinging a mallet and eating dust with us here?" And you were always in some half lit beyond run down building somewhere where you were expecting Leatherface or Jason to come out after you. 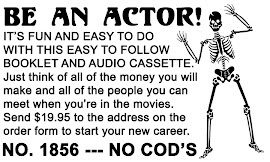 If you never had a job like this the cast does a great job of drawing you in and making you feel like it was your first day there. And it's definitely not a run and slash but it delivers a great creep factor.